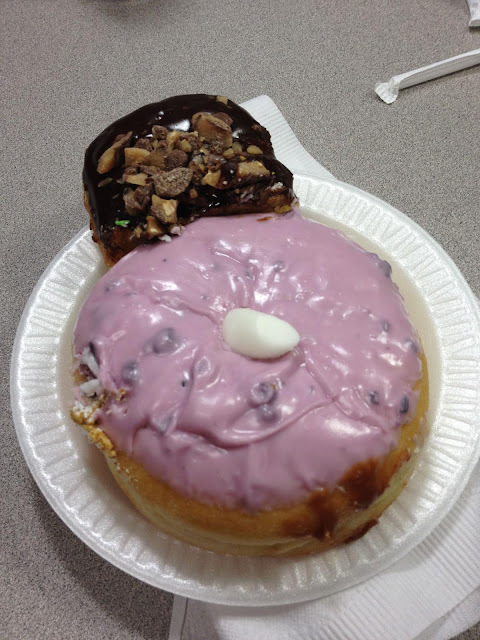 Blueberry Pie donut and a sample of a Heath Bar donut from The Hole Thing in Forney. As a reward for avoiding sweets last week at work we were treated to donuts. They have some great exotic donuts, including maple bacon, red velvet, pecan pie, mr banana man, and Elvis (banana & peanut butter) and a bunch I forgot. Brian got pictures of all of the donuts they got for us at work. I'll see when hes going to post them.